A bilingual English/Arabic word book illustrated with busy scenes and labelled pictures to help children learn key Arabic vocabulary. 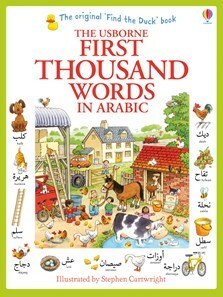 Includes an explanation of the Arabic alphabet and English/Arabic word list. Words are written in Arabic script, with a pronunciation guide in Roman letters. Readers can hear how to pronounce all the Arabic words by listening to a native speaker on the Usborne Quicklinks website. Fantastic book , would recommend it to anyone.